Scuba diving is a sporting activity where you get that rare opportunity to explore the under waters in oceans and lakes. Scuba is short for (self-contained underwater breathing apparatus). What this means is that a scuba diver will need to put on these specialized equipment so they can remain comfortable when under the water surface. The majority of people will scuba dive for the leisure and recreational part of it, to find out and discover how life is under waters. Another special category of scuba divers are those that do it for scientific, commercial, and/ or military reasons. If you are thinking of scuba diving, here are the 5 best places in the world to go scuba diving and enjoy the time of your life. Just the mention of Australia and the first thing that comes to the minds of many is Australia, specifically the Great barrier Reef. This destination is strategically located off this beautiful country of Australia, and happens to be the longest reef with all the coral and tropical sea life that you could ever think of. The second great destination known for scuba diving is Indonesia thanks to the many amazing islands and islets in the region. Pulau Weh, Bali, West Papua, Bunaken Marine Park, Sulawesi, Maluku Islands, Sunda Straights, East Kalimantan, and the Lesser Sunda Islands to mention but a few are some of the islands that attract thousands of scuba divers year in year out. Indonesia boasts attractive marine life, great reefs, and great and amazing waters. Hawaii is one of the most famous tourist destinations in the world, thanks to the thousands of tourist attractions, great sporting activity, and amazing weather that the place boasts all year round. Scuba diving is one of the greatest sports enjoyed in the tourist hub, which is attributed to the many islands that boast wildlife and reefs distinctive only to Hawaii. A list for scuba diving destinations around the world cannot be complete without the mention of the Egyptian red sea, which owes the great scuba diving experience it, offers to lovers of this sport its crystal clear turquoise blue waters, and a very rich life diversity, not to mention stunning reefs. Some of the notable spots for scuba diving in the Red Sea include Sha’ab Abu Buhas, Sharm El Sheikh, Ras Mohammed, and Thistlegorm to mention but a few. 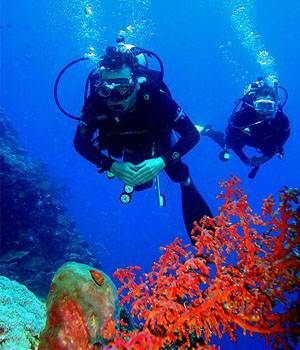 Africa is a great destination for travelers with scuba diving interests. There are several spots in Africa such as the Gansbaai, Aliwa Shoal, Mosselbaai, and the Seychelles that attracts thousands of scuba divers every year. Sadly, Africa has not been popularized as a great destination for scuba diving, probably because it has been overshadowed by some of the above mentioned destinations, but it is still a great place to try. These are just few of the many destinations around the world where you can enjoy scuba diving. Unlike other water sports, the best thing with scuba diving is that you do not need to be an expert to enjoy the sport. Avina the author of the “5 best paces to go scuba diving” is a contributor for the site Kefalonia where you can get interesting information on accommodations in Skala and Kefalonia in general.